In Australia, road users aged 17-24 represent 15% of the population and 1/3 of road deaths. In WA, 20% of drivers killed are under 20, despite being only 6% of all drivers. The main contributors to serious road trauma are speeding, alcohol, fatigued driving and the non-use of restraints. As the driver controls these factors, most road deaths and serious injuries can be prevented. Lack of driving experience is a factor in crashes involving young people, hence why the licensing system focuses on practical experience. New drivers spend more time driving under supervision and twice as long with P plate restrictions than previously. They also have to successfully complete a Hazard Perception Test. Speeding increases crash risk and therefore risk of being seriously injured or killed. Speeding is driving faster than the limit and too fast to suit conditions. Driving above the limit is illegal. If caught, you will be fined and may accumulate demerit points. If on a provisional licence, you could have your licence cancelled. Under ‘Anti-Hoon’ legislation, people caught 45km/h or more above the limit can be charged with reckless driving, resulting in licence suspension or even cancellation. Their vehicles can be impounded/confiscated, if they are racing or doing ‘burnouts’. Why is it more dangerous to drive fast? Always travel so you can anticipate and react safely to sudden dangerous situations. A speed limit is the maximum legal speed allowed in ideal conditions. Adjust speed to suit conditions and never speed. Limits are shown on signs or are default limits that apply to where you are (e.g. ‘built-up’ areas or the State’s maximum on other roads). If there are parked cars, people may open their doors or pull out suddenly. People may step out from between parked cars. If the traffic light ahead is green, it may change by the time you get there, you must be able to stop safely. Be careful if there are potholes. Slow down when there is loose gravel or sand on the road, particularly at bends. If road works are being carried out, slow down and do not exceed speed limits displayed. Slow down if you cannot see clearly because of rain, fog, smoke, bad light, dazzling lights or the sun shining in your eyes. Pay attention when you see cyclists and pedestrians (especially near shopping centres or schools). Pedestrians may forget to look before they cross the road. Give cyclists more space – don’t ‘squeeze’ them off the road. Your speed contributes to how much time you have to react safely. The higher your speed, the less time you have to identify and react to hazards. Driving after drinking or taking drugs increases crash risk (it’s worse when the two are combined). Laws around this save lives. Every police vehicle can perform roadside drug and drink driving tests and the chance of being randomly breath or saliva tested is high. Don’t risk your licence, life, or others by driving while impaired by drugs and/or alcohol. IT IS AN OFFENCE TO DRIVE OR ATTEMPT TO DRIVE WHILE IMPAIRED BY DRUGS. Alcohol is absorbed quickly and travels rapidly to all body parts. It affects your ability to make judgments and process information, and impairs your consciousness and vision. Coffee or soft drink won’t sober you up – only time can. Alcohol also gives you a false sense of confidence. You may take more risks than normal – but remember alcohol slows your reaction time to hazards. BAC is a measure of alcohol in the body (alcohol weight in grams per 100mL of blood). BAC can be determined by analysing a blood, breath or urine sample. BAC begins to rise when you begin drinking and can take up to 2 hours to reach peak concentration, especially if you have eaten a substantial meal at the same time. Even though you may not have had a drink for an hour or more, your BAC may still be rising. The BAC allowed depends on the vehicle type you are authorised to drive and the current status of your licence. The following information sets out the various BAC limits and when they apply. Drink driving penalties apply for offences and may change from time to time. *The zero BAC limit for certain drivers may not apply at all times. 0.02 BAC applies to provisional licence holders that are no longer Novice Drivers. 0.05 BAC applies to all other drivers. How much alcohol takes you over the legal limit? So you do not reach 0.02%, you should not drink alcohol when you intend to drive. Your size and fitness level - If you are unfit or small, it may take you less than the standard number of drinks to exceed the legal limit. Your gender - Alcohol is soluble in water and men tend to have a higher proportion of water than women. Therefore, consuming the same amount of alcohol will usually cause a higher BAC in a woman than a man of a similar size. The amount of alcohol still in your blood from drinking the night before or earlier in the day - If you still have traces of alcohol in your blood, your BAC will be higher than normal after one standard drink. The amount of food in your stomach - Food slows the absorption of alcohol. If you have not eaten a substantial meal before drinking, your BAC may reach the legal limit more quickly than if you have had something substantial to eat. Any drink containing 10g of alcohol is a standard drink. One standard drink will raise an average person’s BAC by about 0.01%, depending upon the factors mentioned. an average sized, healthy man should have no more than 2 standard drinks in the first hour, then no more than 1 standard drink per hour after that. The body breaks down alcohol slowly. A healthy person will take about 1 hour to get rid of the alcohol from 1 standard drink. So, 4 standard drinks in an hour = about 4 hours to get it all out of your system. No amount of coffee or soft drink will speed up the breakdown of alcohol in your body. To ensure you stay below 0.05% BAC, limit your drinking to 1 standard drink per hour. The Department of Health recommends limiting your alcohol intake to 4 standard drinks a day if you are a man and 2 a day if you are a woman. Many drugs and medicines can seriously affect your driving. Drugs such as sedatives or tranquillisers may impair concentration, make you drowsy, and slow your reaction time. Medications for the common cold or travel sickness can do the same. These side effects may last several hours. If you are taking any drugs, check with your doctor or chemist about the effect they may have on your driving. Never combine alcohol and drugs as their effects vary and can be much stronger when used in combination. This can be very dangerous and even deadly. Drink/drug driving is a major contributor to road fatalities in WA. Be aware of the effects alcohol/drugs can have on alertness, vigilance and ability to react rapidly to unexpected hazards. Some drugs can increase the impairing effects of alcohol and fatigue. Police can stop motorists and require them to take a random drug or alcohol test to detect the presence of prescribed/illicit drugs or alcohol. It is a serious offence to refuse a random breath test, or a request to give a saliva sample for drug testing. One way to avoid drinking too much is to alternate alcoholic drinks with water, non-alcoholic or low alcohol drinks. Don’t get involved in ‘shouts’ to buy rounds of drinks. If you crash while over the BAC level or drug-impaired, insurance will not cover you. How do seat belts work in a crash? The car collision is the first. The car hits something and stops. The part that first impacts stops immediately. Often, the engine bay or boot absorbs some impact. The driver/passenger section can remain comparatively undamaged. The human collision is the second and more dangerous collision. Occupants are thrown about inside the car, or even out of the car. If not restrained by a seat belt, you will keep moving when the car suddenly stops. If travelling at 100km/h on impact, you will continue at that speed after the collision. If not wearing a seat belt, you will hit other people or some part of the car. Higher speeds mean greater force at which you will be thrown inside or out of the car. The human collision injures and kills people. Seat belts help prevent injury and death. Seat belts prevent the human collision. Wearing a seat belt protects against being thrown from the vehicle or thrown around in the driver/passenger compartment – hitting parts of the car or other occupants. Good drivers have crashes too. 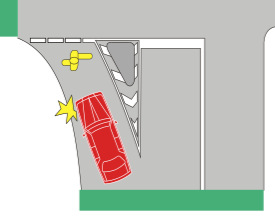 All drivers have some crash risk. People who drink, drive fast, are tired, discourteous or inexperienced, have a higher crash risk. You never know when you may encounter these drivers – so always wear your seat belt. People are rarely trapped because of seat belts. catches fire or falls into water. Wearing a seat belt does increase your chances of being alive and conscious so you can escape fire or water after a crash. Seat belts save us money. As we all pay the medical, legal, invalid pensions, and higher insurance costs in one way or another, preventing injuries by wearing a seat belt is in everyone’s best interest. The driver and each passenger must be restrained and in a seated position. Seat belts are designed for 1 person. ‘Doubling up’ (2 people using 1 belt) is illegal and unsafe. Seat belts work just as well in the back seat. You must wear a seat belt in the back seat. If you don’t you may hit some part of the vehicle or other people in a crash. Seat belts must be worn on short, as well as long trips. Many crashes occur close to the driver’s home – always wear your seat belt. Seat belts must be worn by pregnant women. Unless they have a current medical certificate exempting them. A seat belt worn correctly across the hips (below the baby) is unlikely to affect an unborn child. There is a higher risk to a baby if the mother is not wearing a seat belt. 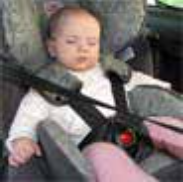 Child car restraint law - children need protection too. Unrestrained children and babies can be injured during hard braking. An adult’s lap is not safe in a crash. Even when small, an adult can’t hold onto the child in a crash. WA introduced national child restraint laws to keep children safe in vehicles. Fines and traffic penalties apply to the driver if children are not restrained in accordance with laws. 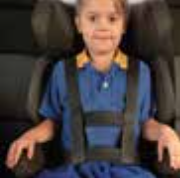 Child restraint laws apply to passengers under 7 who must wear a suitable restraint. These laws also specify where children are permitted to sit in a vehicle. In a vehicle with 2 or more rows, children under 4 must sit in the rear seats. Children aged 4-7 are not permitted in the front seats unless all rear seats are taken by children less than 7. Children aged 7 and over can sit in any seating position if suitably restrained. From birth until 6 months of age you are required to use a rearward-facing child restraint, and seat the child in the rear seats at all times. Must use either a rearward facing child restraint or a forward-facing child restraint that has an inbuilt harness. Children up to 4 must sit not sit in the front row of a vehicle that has 2 or more rows. Must be restrained in a forward-facing child restraint with an inbuilt harness or in a booster seat restrained by either a seatbelt or child harness. These children are not permitted in the front seat unless all rear seats are occupied by children less than 7. If a child occupies a front seat with a passenger airbag, move the seat as far back as possible while allowing correct restraint and seat belt fit. Children outside weight/size guidelines for existing restraints are able to use the restraint for the next age group. Before you purchase or install a restraint, ensure it complies with Australian Standards. Never ride in the back of a utility, panel van or station wagon. It is illegal to ride in the back of a ute or other ‘open load’ space. When in the open load space of a ute or in the back of a panel van or station wagon you face a greater risk of serious injury or death, particularly if you crash or fall out. It has been illegal to carry any passengers in the tray of utes or open load spaces in other vehicles, even if it has a roll-over protection device fitted, since 31 December 2005. What if your passengers do not wear a seat belt? Drivers are legally responsible for ensuring children up to 16 are suitably restrained. You are responsible for ensuring children under 7 are wearing a suitable restraint that is properly adjusted and securely fastened. Only passengers sitting in a seat fitted with a seat belt or restraint suitably fastened can be carried in the vehicle. Exceptions apply for passengers aged 7 and over where the vehicle is not required to have seatbelts fitted. No additional unrestrained passengers are allowed and passengers cannot share the same seat or seatbelt. A seat belt is legally required to be properly adjusted and securely fastened - tight but comfortable. The buckle should be at your side and there should be no twists or knots in the straps. Properly working retractable seat belts will self-adjust. What should I do if my seat belt is in poor condition? It is illegal and unsafe to use worn, frayed, faded or damaged seat belts - replace them. Driver fatigue (driving when tired) is a major road safety hazard. Fatigue crashes tend to be severe as sleepy drivers don’t take evasive action (risk of serious injury is very high). Fatigue is mental/physical tiredness that causes loss of alertness, reduced driving skill, poor judgement, drowsiness, slower reactions and may cause you to fall asleep. Drowsy drivers can drift into ‘micro-sleeps’ (brief naps that lasts around 3-5 seconds). At 100km/h you can travel over 100m in that time, enough to run off the road. after midnight your body will turn alertness right down so that you are ‘switched off’ between 2 and 6am (when your body functions are at their lowest level). You will usually be at your best, most alert and safest when driving during the morning, late afternoon and early evening. You will usually be at your worst between 12 and 6am when the body clock turns your alertness down. This is a dangerous time for drivers. Although there are fewer drivers on the road between 12 and 6am, statistics show they can be up to 20 times more likely to have a crash during those hours. Enough sleep is the only way to prevent fatigue. 7.5 hours of sleep is recognised as an average/normal need. If you get much less, you will be fatigued. You will feel tired during the day and much worse at night when your body turns your alertness down. Fatigued drivers are a danger to themselves and others. If you have not had any sleep for 17-18 hours, your ability to drive will be the same as if you had a BAC of 0.05%. That way over the 0.00% BAC limit for a novice driver and doubles your crash risk. Although you may like to go out until the early hours of the morning, be aware that driving while fatigued is a big risk and if you crash because you are not alert, you are likely to be held responsible. Long working or study hours or physically tiring work can affect your driving. Shift workers need to take extra care as they are 6 times more likely to be involved in ‘fatigue-related’ road crashes than other workers. Medical factors can prevent you from getting the periods of sleep you need to feel refreshed and alert. If you had enough sleep but still feel tired and drowsy consult your doctor. Look after yourself – healthier/fitter people sleep better and are more alert. Don’t use stimulants to keep you awake - these just delay sleep. When they wear off there can be sudden onset of sleepiness, which is dangerous, especially when driving. What are the warning signs of driver fatigue? Be honest with yourself. If you experience these signs, stop and take a break. Once fatigue sets in, all you can do is stop immediately and take a break/nap. Under ‘Anti-Hoon’ legislation, reckless drivers/motorcyclists can have their vehicles impounded or confiscated. Driving like a hoon can get your vehicle arrested. People caught racing or doing ‘burnouts’ can lose their vehicles for 48 hours. A second offence can result in licence suspension and up to 3 months of impoundment. A third can result in permanent licence disqualification and the vehicle being confiscated. It is illegal to use text/video message, email or similar communication while driving. The GPS function of a phone may be used as long as the phone is secured in a mounting, and the driver does not need to touch it (including the keypad or screen). crossing in front of you at a slip lane (a left turn lane with an island between that lane and lanes for other traffic). At children’s crossings, stop before the crossing when the attendant extends the flags. Do not move until the attendant withdraws the flags signalling you can go. These are intersections controlled by traffic lights where pedestrians are permitted to walk on the green pedestrian signal, parallel to the flow of traffic. The lights for pedestrians turn green a few seconds before drivers are given their green light and turning vehicles must give way to pedestrians crossing. checking your blind spots for riders. You do not have perfect vision from within your vehicle. There are blind spots at the sides and rear. Check them by looking over your shoulder before you move left or right. Cyclists may legally use the whole lane on roads with lane markings. They are allowed to ride side-by-side. Being smaller than other vehicles, motorcycles are not easily seen. In addition to the road rules that apply to all road users, additional rules to help protect motorcyclists. To reduce the risk of sustaining severe injuries, always wear protective clothing that includes a jacket (bright colour recommended), long trousers, an approved safety helmet (light colour recommended) with fastened strap, eye protection, gloves, and sturdy footwear. The minimum is closed shoes, long pants, a jacket, and a helmet. You must wear appropriate protective clothing for your practical assessment. Many lightweight items will protect you just as well as heavier clothing. Take extra care when you carry a passenger. You may carry one passenger on your motorcycle if you have a pillion seat and separate footrests. The passenger must wear appropriate protective clothing (including an approved helmet), sit behind the rider, face forward and always have both feet on footrests (if they can’t reach footrests they can’t be carried). Motorcycle passengers must be 8 or older (unless in a sidecar). Passenger add weight making the motorcycle respond slower. Adjust your riding to allow for the extra weight. Talking to your passenger should be minimised as it can distract you and increase your reaction time. do not ride in a driver’s blind spot. If they cannot see you, they may make a manoeuvre without making allowance for your motorcycle. if you wish to travel at the same speed as another vehicle, travel behind or in front of it to make sure you can be seen. at intersections, drivers may not see you. Do not assume that they have. It is a good habit (and important to develop the skill) to use both front and rear brakes every time you slow down or stop as you will need to do this in an emergency stop. Apply both brakes gently but firmly. Squeeze the front brake and press down on the rear brake. Do not ‘grab’ at the front brake or jam your foot down on the rear brake as this can cause the brakes to lock, resulting in serious control problems. Always reduce your speed before entering a bend as entering a turn too quickly means you may lose control of your motorcycle. Is your car in safe working order? Tyre tread should be at least 1.5mm deep (match head thickness) over all parts that come in contact with road. Smooth tyres can cause skidding and can be dangerous in wet conditions. Tyres should be inflated to manufacturer specifications (pressure should be check when tyres are cold). This is particularly important when driving long distances or carrying a full load. Have your brakes checked regularly. Faulty brakes = longer stopping distance. Ensure your steering assembly is in good condition. Faulty steering = wandering car. Make sure that all vehicle lights are operating correctly. Faulty lights = other drivers may not be able to see you or may not understand your intentions. Use your horn to warn others of danger – it is an offence to use it for other purposes. A clean windscreen is easier to see through (especially when driving into the sun, at night or in the rain). Replace faulty/damaged windscreen wipers as they prevent clear vision during rain. You are required to have a mirror on your car and it is illegal to hang things from it. Even with mirrors, your car has areas you can’t see without looking over your shoulder. Vehicles (especially motorcycles and bicycles) can be completely hidden in blind spots. Make sure that your interior and exterior rear view mirrors are correctly adjusted (when you are in the correct driving position, they should help you see what is on the road next to you and behind you). The following are tips for adjusting your mirrors. EXTERIOR REAR VIEW MIRRORS – adjust the mirrors so that you can just see the tip of your door handle in the lower edge of the mirror (corner closet to the car). To check that mirrors positioning is correct, let a vehicle pass you on the right. As it leaves your interior mirror, its front bumper should appear in your exterior mirror.